It was Val’s birthday and Name Day today (St Katherine of Alexandria), and we had a pretty busy day. First we went to the Hours and Readers Service at Mamelodi, and then went to the annual prizegiving at St Athanasius School in Tembisa, with the monks from St Thomas’s Orthodox Church in Sunninghill. 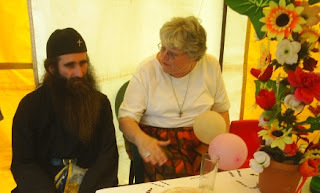 Here is Val with Fr Evsevije (Eusebius). At the prizegiving just about all the children got certificates for something, and several of them presented plays or sang songs. For a fuller report see my Khanya blog. Yesterday we had a letter from Andy Blum in the USA, asking about a David Ogilvie who was mentioned in a family history newsletter from Blue Earth, Minnesota, USA. This David Ogilvie (1852-1943) had a fairly interesting life, and Andy wondered if he was related to the Ogilvie family of the Eastern Cape, from which Andy himself is descended. We couldn’t trace any connection, however. The Ogilvie connection is through Emily Ogilvie (1827-1912) who married Edward Lister Green (1827-1887), who was the brother of Val’s Great Great Grandfather Frederick Thomas Green (1829-1876). The Green brothers were born in Montreal, Canada, and came to South Africa with their widowed father in the 1840s. Edward Lister Green was a soldier who served in India, China and Ireland, and eventually moved to New Zealand, where he died in 1887. Some of their children moved to the USA, and Emily died in California where she was living with her daughter Maud Ogilvie Jowett. Emily was the daughter of William Ogilvie (1795-1850) who fought at Waterloo and came to the Cape Colony with Lord Charles Somerset, the Governor. He married Mary Maria Hollings, who was governess to Lord Charles Somerset’s family. They had four sons and four daughters, but none of them seem to have had Minnesota connections, other than some of Emily’s descendants. William Ogilvie had a hardware store, and sold Westley-Richards rifles, and two members of the Richards family came from Birmingham to Grahamstown and married two of the Ogilvie daughters. Andy Nation of New Zealand had Edward Lister Green’s diary and sent us a copy of it with some family history notes he had made. We have transcribed it on to computer, and can send copies to interested family members. There is more information about the Ogilvies in Some frontier families by I. Mitford-Barberton and Violet White (Cape Town, Human & Rousseau, 1968). Edward and Emily Green had 6 children, and among their descendants are the Nation, Rutherfurd, Mocine, Lewis and Blum families. In more immediate family news, our dog Ariel recently had puppies in her old age. For anyone interested, there is a report and pictures on my tribal blog.